Aspen Creek Lansdscaping, a potential partner in your landscape development, is proud to be a provider of high quality landscape installation and maintenance services. Our professional team of experts can help you beautify your landscape. From landscape design to installation we can add value and increase the enjoyment of your home. 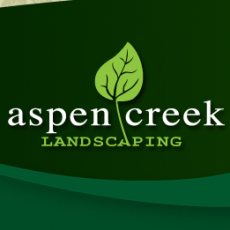 Aspen Creek Lansdscaping designs and installs landscapes that work. Whether you have a project that entails the full design and construction of your five-acre property, or the simple task of maintaining your city lot, we can do it!